Why did one couple jump to their deaths from George Washington bridge? 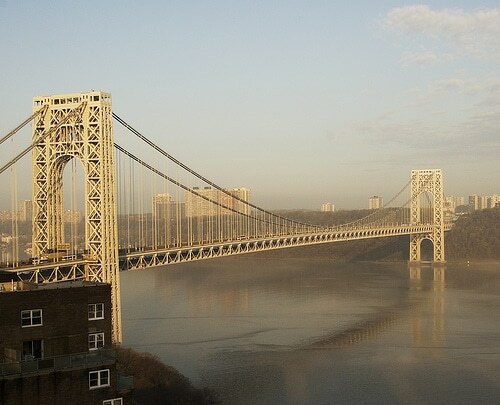 Home Scandal and Gossip Why did one couple jump to their deaths from George Washington bridge? Authorities are trying to make sense of what led to one couple this late morning jumping to their deaths from George Washington bridge in what has been billed as a joint suicide. Investigators would later tell after pulling the pair up from the water that the couple appeared to be between 40 and 50 years old. Port Authority spokesperson Joseph Pentangelo said workers on the lower level of the bridge observed objects going past them. Upon turning to look into the water below, they saw the couple in the water. The bridge is about 212 feet above the river at midspan. The pair floated about 1,000 feet to 125th St. by the time the FDNY and NYPD pulled them out at 12:09 p.m. Despite medics performing CPR on the couple and being rushed to hospital the barely alive couple would soon die. Responding medics were first alerted at 11.20am. No car or note was found by the bridge as authorities continue to determine their identities and as to why today they chose to jump to their deaths. ‘A witness said they went off holding hands,’ said a source, who spoke on condition of anonymity because he was not authorized to discuss the matter. Pentangelo would later tell that one victim carried a set of car keys, but no abandoned car would be found near the bridge. Another man jumped from the bridge earlier this month, and several minutes later, panicked motorists stopped a woman from doing the same. You can call 24 hours per day/7 days per week. The hotline’s staff of trained mental health professionals help callers find mental health and substance abuse services.